Certain optical system designs require multiple optical elements to be positioned accurately as an array. In the past, individual optics were produced and connected to a common substrate, which posed significant position and alignment challenges. Now, with II-VI’s advanced diamond-turning techniques, it is possible to machine monolithic optical arrays directly on a substrate, with II-VI’s fast tool servo technology. Typical substrate materials include ZnSe and Ge, and metals including Cu and Al. 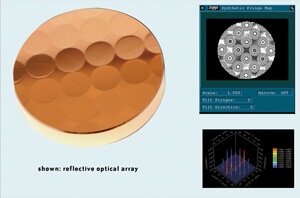 A common application for this optical design is a focusing lens array with lenslets having identical focal lengths. However, it is not necessary to produce only lenslets with equal focal lengths on one substrate. Individual elements may have different focal lengths, including a mixture of positive and negative elements. It is also possible to combine lenses and mirrors. Monolithic optical arrays provide the designer with one more tool in the design bag for producing small, complex, optical elements for advanced applications. Monolithic optical arrays provide unique, compact optical solutions. Lenslet arrays are easily machined and provide multifocus arrays. Combinations of lenses, mirrors, or other optical elements are possible on one substrate.